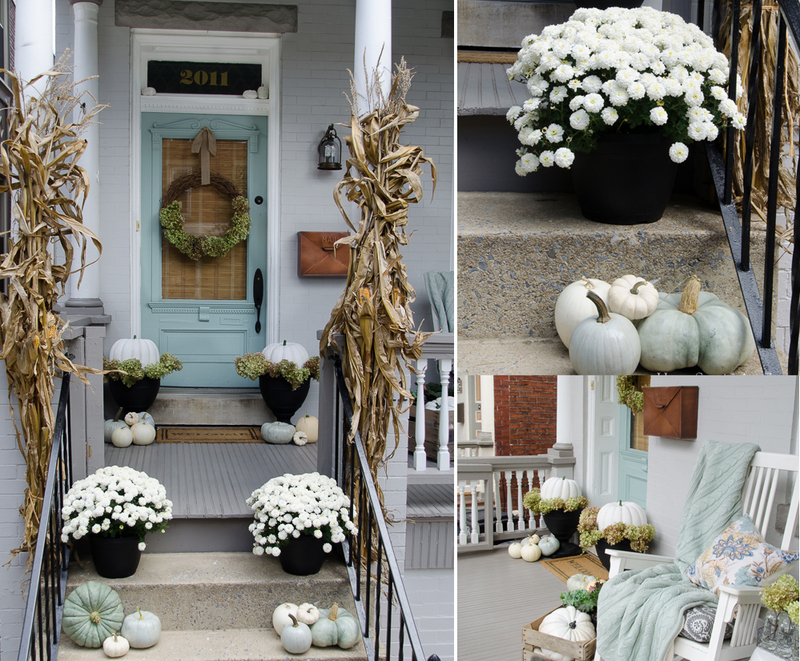 Have you ever walked around the block admiring neighbors’ fall porch decor ideas and dreaming about creating your own unique look on a budget? 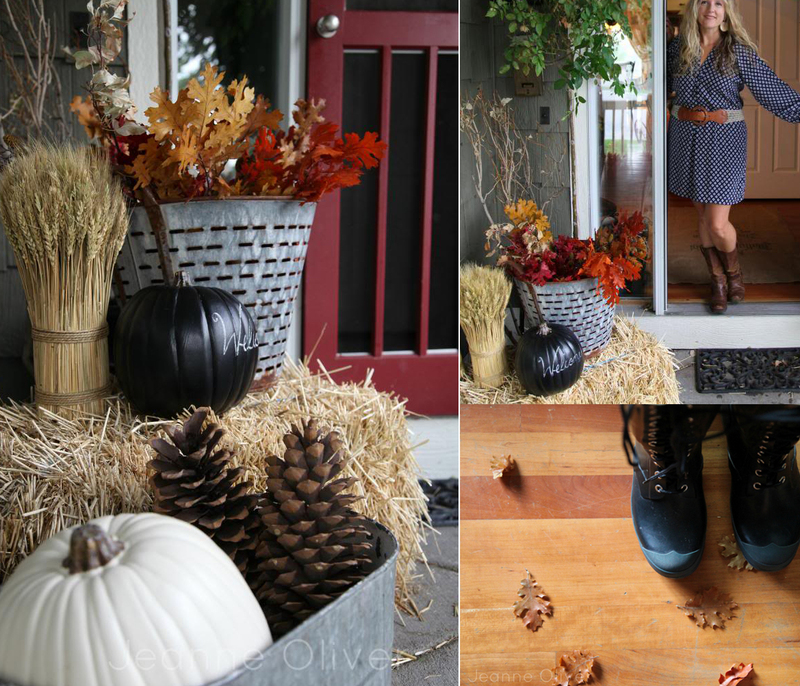 Here are some ideas to help you make your porch a head-turner with only a few items widely available to purchase in the fall or easy to make! 1. 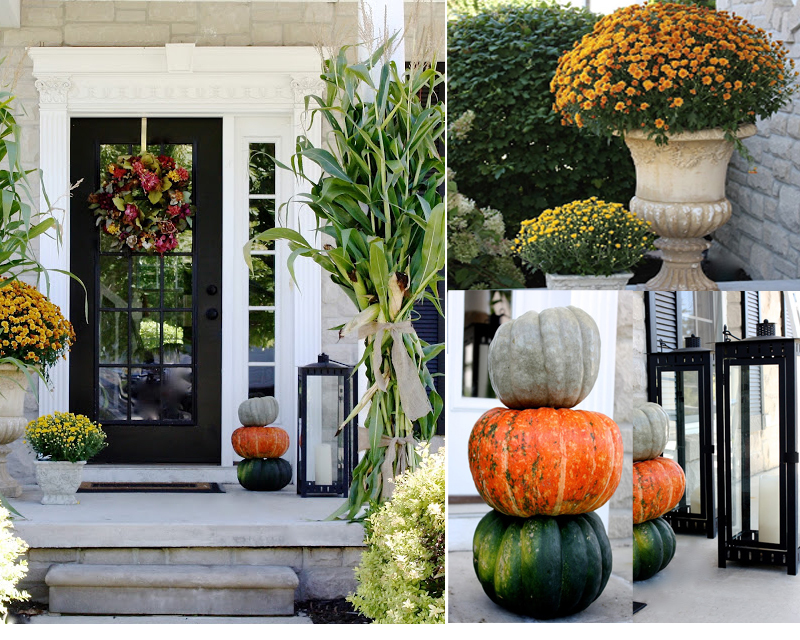 It is easy to prepare your home for Fall with cornstalks, pumpkins, and colorful mums. You can easily pick up these items at the local farm hosting a pumpkin patch which also turns your decor project hunt into a fun family outing. Pick unique seasonal gourds for a statement of color or white pumpkins for a pastel look. Colorful fall mums in yellow, orange and dark burgundy are widely available at the grocery stores, harvest markets, and home improvement stores. Put them in different size containers as an easy outdoor flower arrangement. Adding a few classic statement items, such as black candle lanterns with battery-operated candles on a timer, makes the look complete and easy to maintain. It will even illuminate your porch in the dark. 2. You have packed away your colorful summer pillows but you can still decorate your porch for fall. Give your bench and other porch furniture a coat of white outdoor paint – it will provide a refreshing contrast with bright fall colors. Add a few pumpkins in bright colors. Seasonal flowers, such as kalanchoe (Kalanchoe blossfeldiana) will give a burst of color while providing medicinal use if you need it. Easy-to-make over-sized burlap pillow with a plaid fall throw makes your porch cozy and warm for waiting for a school bus or some romantic evenings of star-gazing. 3. Looking for a simple and space-saving rustic fall decor? This is one of our favorites for its simplicity. 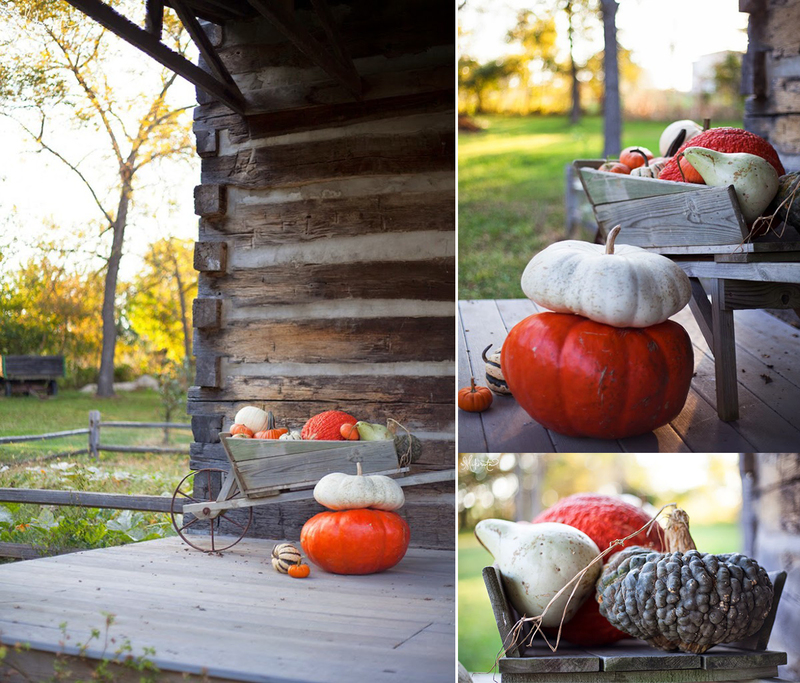 All you would need is a vintage wheel barrel and a few colorful gourds and pumpkins strategically placed on the porch. Even if you don’t live in a rustic wooden cabin, this decor is perfect for any minimalistic or rustic style. And the best part – when it is time, you can make some yummy pumpkins pies! This is the best of both worlds: live on a budget and re-purpose your decor. 4. Fall colors can be a bit overwhelming and may not be your ‘cup of tea.’ Instead of a bright color statement, you may want a calm and relaxing environment for your porch. If your house already has some pastel colors in its exterior decor, it makes sense to compliment it with a white, grey, and soft green colors. Dried hydrangeas and creme-colored pumpkins (real, painted, or faux) placed in a wooden box are a great way to add some traditional colors. Love how white mums brighten this porch on a gloomy fall day. Add vintage white rain boots, pastel pillows, and throws, welcome mat, and a simple green wreath to complete this cozy traditional look. 5. Many of your family mornings start on a cozy porch – it is a place for a family gathering before a busy day, quiet place to read devotions, drink your coffee, and breathe cool fall air. 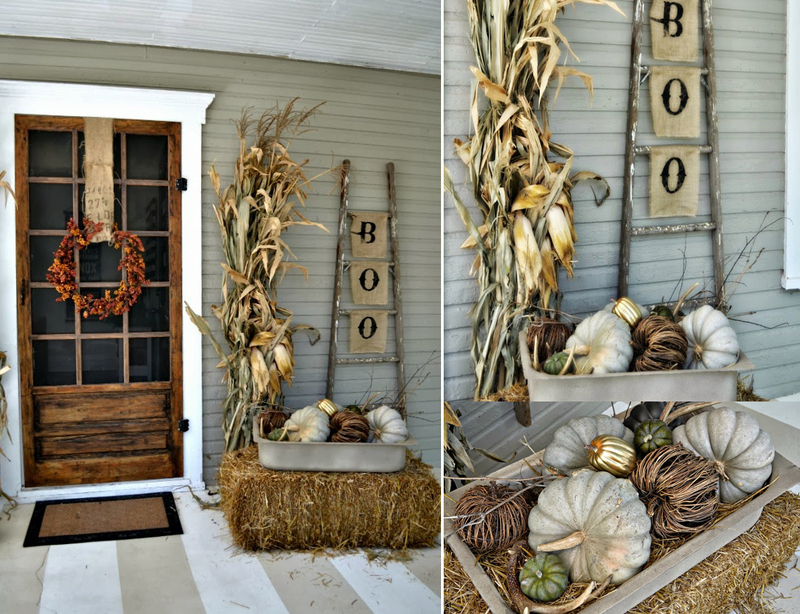 Create this look with just a few items – hay bale, tin container, fall leaves (real or faux), pine cones, and pumpkins (white and chalkboard-painted). Write a welcome or spooky message to make it uniquely yours! 6. One of our favorite things about decorating for fall is to use items that come from nature: hay bales, corn stalks, mums, and pumpkins. What makes this porch decor unique and interesting is a mix of colors and textures. Be bold: paint one pumpkin with metallic gold spray paint. Don’t have a pretty container to display fall pumpkins? Spray-paint an old sink. Burlap pillows with black applique on a metal bench look so appropriate. Vintage wooden ladder, even with old paint splashes, lets you display your message in style. 7. 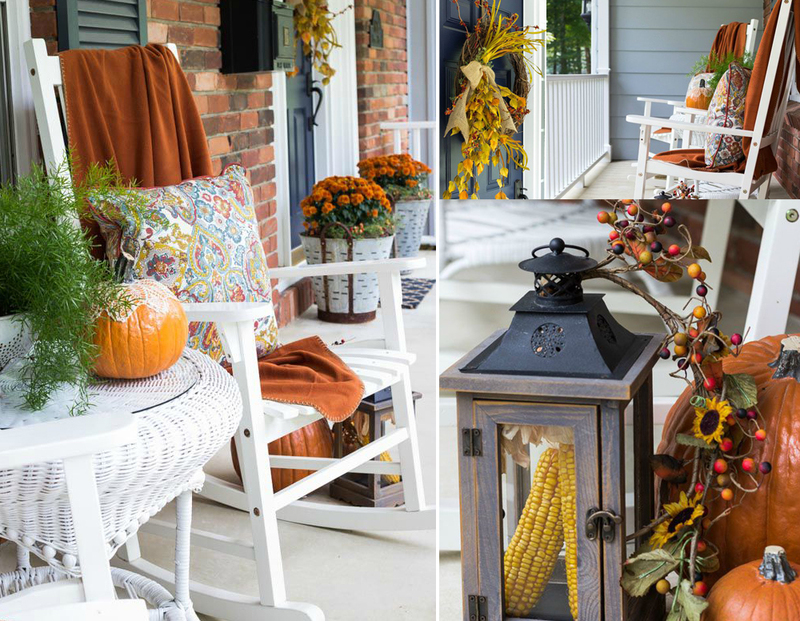 Do you need step-by-step instructions for a fun and easy fall porch decor? Find SIMPLE steps (and links to DIY tutorials) here: fall wreath, planters that flank the front door, throws, and pillows, as well as ideas for clever accessories (hide corn inside the lantern from squirrels). 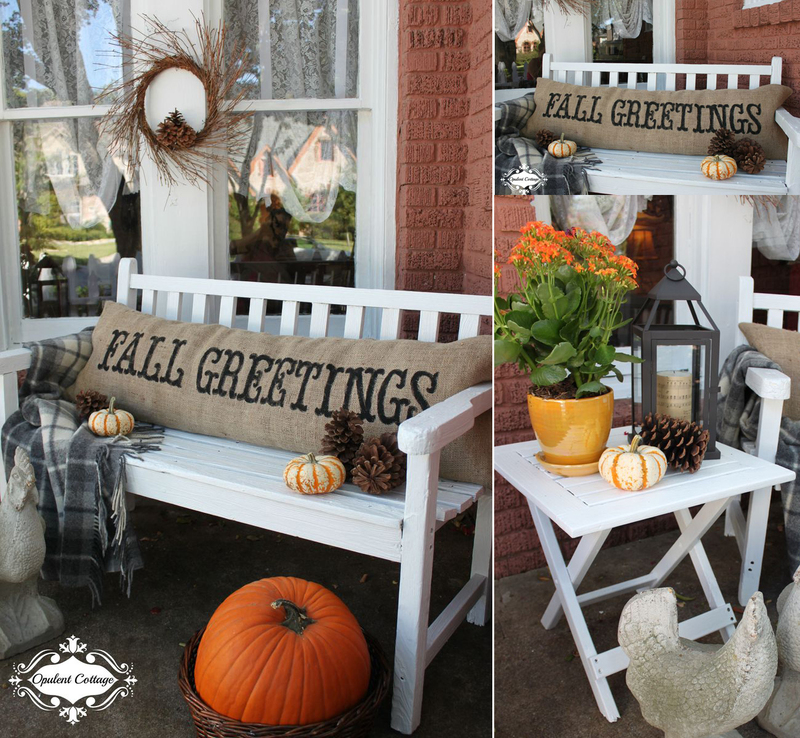 Navy and orange colors together look strikingly fresh, giving this porch a classic fall look. You will even find the links where to buy all these decor and furniture items.